The app will insert subtitle file into video . 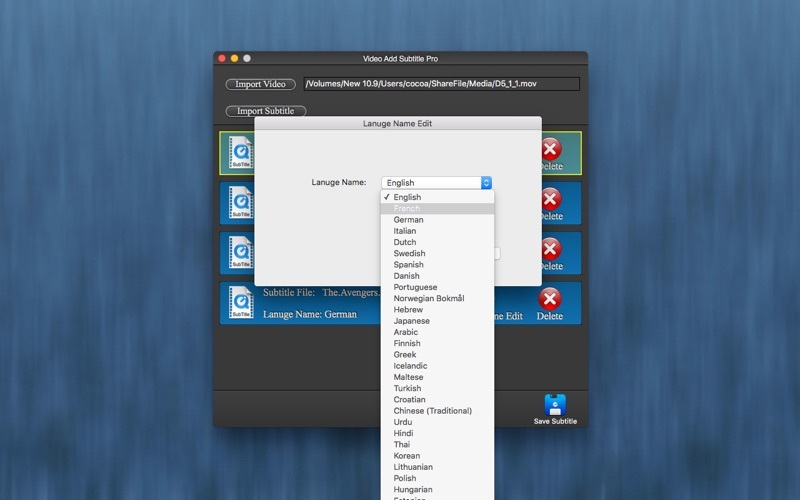 You can add multiple subtitle files into video file . The app can add multiple subtitle tracks to your movie, you can play the movie with different subtitle tracks . mp4, mov, rm, rmvb, avi, dv, mkv, wmv, m4v, mpeg, 3gp, 3g2, 3gp2, mpg, flv, f4v, asf, ts, tp, trp, mts, m2ts, dat, mod, nsv, evo and many more . If you have some problems, please send an email to chaoyuemesoft@126.com . I will solve these issues as quickly as possible.